How Necessary Are Subconjunctival Antibiotics Following Pars Plana Vitrectomy? No difference in rates of postoperative endophthalmitis was observed in individuals treated with perioperative subconjunctival antibiotics to manage postoperative complications associated with pars plana vitrectomy (PPV) versus those who were not, according to case series analysis published in the journal Retina. The investigators analyzed the data on perioperative subconjunctival antibiotics use after PPV and suggested that they can be abandoned because they may be unnecessary and even harmful. The use of subconjunctival antibiotics has been a routine part of endophthalmitis prophylaxis at the end of ophthalmic procedures for decades. Subconjunctival antibiotics are used to provide an additional drug reservoir for an extended duration during the postoperative period and enhance microbial eradication. The case series reported very low rates of endophthalmitis after cataract surgery using subconjunctival antibiotics despite this, its use has declined in recent times. In 2014 the American Society of Cataract and Refractive Surgery (ASCRS) members’ survey, only 8% reported the use of prophylactic subconjunctival antibiotics during cataract surgery in part because of the increased use of prophylactic intracameral and topical antibiotics. 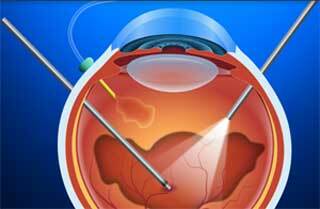 Most cataract surgeons have abandoned this practice partly because of a switch to intracameral and topical antibiotics. The switch to intracameral antibiotic prophylaxis is not without complications. Although there is some evidence of efficacy, the complications (hemorrhagic occlusive retinal vasculitis and antibiotic mixing errors among other complications) might overshadow the benefits. The authors concluded that in view of the apparent lack of efficacy as well as the need for antibiotic stewardship, subconjunctival antibiotics for endophthalmitis prophylaxis may not be necessary during vitrectomy.